Many enterprises have invested heavily in business intelligence (BI) and analytics solutions, but they aren't always seeing the benefits they had hoped to achieve with those solutions. More specifically, they say that it takes too long to achieve value when starting a new analytics project. That is one of the key findings of a new study titled "Accelerating the Path to Value with Business Intelligence and Analytics," published by TDWI. For the report, which was sponsored by Cambridge Semantics, Looker, Modemetric, SAP, SAS, Tableau Software, Unifi and Zoomdata, TDWI surveyed 224 BI and data professionals. 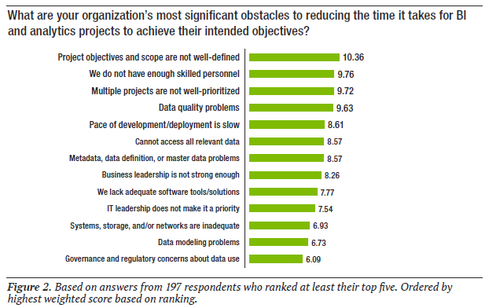 When asked to prioritize their goals for their BI and analytics efforts, survey respondents ranked "reduce project time to value" number one. That wasn't a surprise for David Stodder, senior director research, business intelligence at TDWI and the author of the report. "I hear all the time that organizations want to get to value faster," he said. However, when asked about their satisfaction with the current time to value of their projects, only 10% said they were "very satisfied," and nearly half (45%) were either "somewhat unsatisfied" or "not very satisfied." The reason for that dissatisfaction became clearer when respondents were asked to compare their current time to value with past performance. Only 8% of those surveyed said projects are delivering value much faster than they were a year ago. While 35% said the pace was "somewhat faster," 28% percent said it was "about the same," and nearly a quarter (24%) said it was either "somewhat slower" or "much slower." Given the rapid and ever-increasing pace of business, those extended timelines are simply unacceptable for most enterprises. What's causing the slow time to value for BI and analytics projects? It doesn't seem to be a lack of investment. "There's been a lot of technology thrown at the problem," Stodder observed. In fact, market analysts at IDC predict organizations will spend $150.8 billion on big data and business analytics technologies in 2017, and they forecast that revenues for this category will top $210 billion by 2020. "It's not just a technology problem," Stodder said. He has seen many situations where organizations "get the technology and they start to play around with it, but they can't really connect it to actual business goals and what they are trying to accomplish." 1. Project objectives and scope are not well-defined. Many organizations have invested in data analytics technologies without clarifying how they are going to use them. While Stodder noted that leaving room for exploration and discovery can be good, it can also lead to problems. One of the survey participants said, "Less clarity through scope and requirements definition has caused extended timelines." Another said, "Projects are slower due to lack of clarity [and] organizational boundaries in a highly dependent system." 2. We do not have enough skilled personnel. Although self-service BI tools and an increase in the number of job seekers with BI skills have alleviated the problem somewhat, organizations still struggle to find the qualified professionals they need. In the survey, 45% of participants ranked this obstacle in their top three. In particular, scaling BI efforts to keep up with demand seems to be difficult. “We have a larger number of reports, analytics, and users to support, but the resources and procedures in our organization remain unchanged," one participant said. "The expanded scope of the team leaves resources stretched thin." 3. Multiple projects are not well-prioritized. The third-biggest challenge is also closely related to project management. This challenge often ties closely to problems with overall strategy and inadequate staffing. One of the BI professionals noted, "Turnover of personnel and poorly defined and managed requirements have led to a slower delivery cycle." 4. Data quality problems. Stodder noted that after investing in BI and analytics technologies many organizations discover they have problems with the quality of their data. As a result, many data scientists may spend up to a year addressing data management and governance before they can tackle the analytics needs of their organizations. To overcome those challenges, Stodder offered several suggestions. "They need to spend more time thinking about what they are trying to do," he said. They shouldn't "try to do everything at once." In addition, Stodder recommended that organizations "think big." He noted that when analytics projects are successful, enterprises often want to expand the project scope, bringing in more data and more people. However, "a lot of organizations don't think about what they are going to do to scale it up, to grow," he said. Although many analytics projects are spearheaded by the business side, he recommended bringing in IT to help with the scaling challenges. Evaluate agile methods to improve business/IT collaboration and produce value sooner. Establish metrics for determining whether BI and analytics are delivering value and ROI. Aim for managed and governed self-service BI, analytics, and data preparation to avoid data chaos. Address deficiencies in number of skilled personnel. Encourage guidance from internal BI teams and outside experts. The complete report is available at the TDWI website.